Known as the most notorious identical set of thugs, the Kray twins, born in 1933, ran deadly mafia-style operations in London's East End throughout the '50s and '60s. 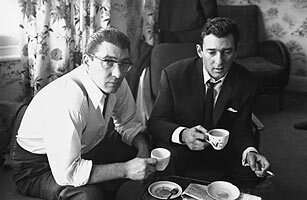 Though they started off as amateur boxers, Reggie and Ronnie Kray moved on to extortion, armed robbery, arson, hijacking, assault, torture and murder. "In gang fights they seemed to be telepathic, as if they were one," wrote John Pearson, author of The Cult of Violence: The Untold Story of the Krays. The London-born brothers, who owned several nightclubs, also enjoyed a kind of celebrity status, mingling with the likes of Frank Sinatra and Judy Garland. But the party eventually came to an end. In 1968, they were arrested and convicted for the murders of Jack "The Hat" McVitie (by Reggie's hand) and George Cornell (by Ronnie's). Ronnie died of a heart attack in 1995, while Reggie, who had cancer, passed weeks after his release from prison in 2000. See the 10 heroes of the London riots.